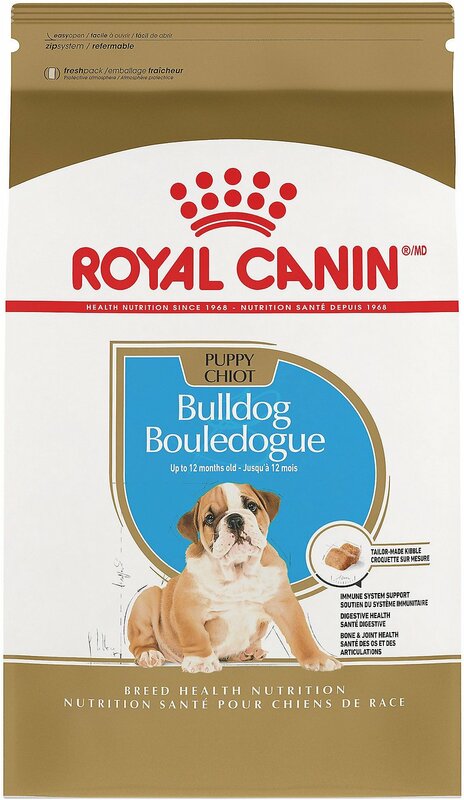 This Royal Canin formula is designed exclusively for pure breed English Bulldog puppies from 8 weeks to 12 months. English Bulldog puppies have a “short stop” muzzle, which makes it more difficult to grasp and chew its food. The breed’s sedentary nature makes it prone to weight gain, and its unique physique can benefit from nutrients to support joint health. That's why it's important to feed a diet that is tailor-made for a Bulldog puppy's specific needs. This product has recently undergone a packaging and formulation change. Customers may receive the old packaging and formula during this transition. New Formulation: Chicken By-Product Meal, Brewers Rice, Brown Rice, Chicken Fat, Wheat Gluten, Oat Groats, Pork Meal, Natural Flavors, Dried Plain Beet Pulp, Pea Fiber, Fish Oil, Vegetable Oil, Sodium Silico Aluminate, Potassium Chloride, Monocalcium Phosphate, Calcium Carbonate, Fructooligosaccharides, Sodium Tripolyphosphate, Vitamins [Dl-Alpha Tocopherol Acetate (Source Of Vitamin E), Niacin Supplement, L-Ascorbyl-2-Polyphosphate (Source Of Vitamin C), D-Calcium Pantothenate, Biotin, Pyridoxine Hydrochloride (Vitamin B6), Riboflavin Supplement, Thiamine Mononitrate (Vitamin B1), Vitamin A Acetate, Folic Acid, Vitamin B12 Supplement, Vitamin D3 Supplement], Hydrolyzed Yeast (Source Of Betaglucans), Salt, Dl-Methionine, Choline Chloride, Glucosamine Hydrochloride, Marigold Extract (Tagetes Erecta L.), Trace Minerals [Zinc Proteinate, Zinc Oxide, Manganese Proteinate, Ferrous Sulfate, Manganous Oxide, Copper Sulfate, Calcium Iodate, Sodium Selenite, Copper Proteinate], Taurine, Yucca Schidigera Extract, Chondroitin Sulfate, Carotene, Rosemary Extract, Preserved With Mixed Tocopherols And Citric Acid. Old Formulation: Chicken By-Product Meal, Brewers Rice, Brown Rice, Chicken Fat, Wheat Gluten, Oat Groats, Natural Flavors, Pork Meal, Dried Plain Beet Pulp, Pea Fiber, Fish Oil, Vegetable Oil, Sodium Silico Aluminate, Potassium Chloride, Calcium Carbonate, Monocalcium Phosphate, Salt, Fructooligosaccharides, Sodium Tripolyphosphate, Taurine, Hydrolyzed Yeast, Vitamins [Dl-Alpha Tocopherol Acetate (Source of Vitamin E), Inositol, Niacin Supplement, L-Ascorbyl-2- Polyphosphate (Source of Vitamin C), D-Calcium Pantothenate, Biotin, Pyridoxine Hydrochloride (Vitamin B6), Riboflavin Supplement, Thiamine Mononitrate (Vitamin B1), Vitamin A Acetate, Folic Acid, Vitamin B12 Supplement, Vitamin D3 Supplement], Choline Chloride, Dl-Methionine, Glucosamine Hydrochloride, Marigold Extract (Tagetes Erecta L.), L-Lysine, Trace Minerals [Zinc Proteinate, Zinc Oxide, Ferrous Sulfate, Manganese Proteinate, Manganous Oxide, Copper Sulfate, Calcium Iodate, Sodium Selenite, Copper Proteinate], Chondroitin Sulfate, Rosemary Extract, Preserved with Mixed Tocopherols and Citric Acid. 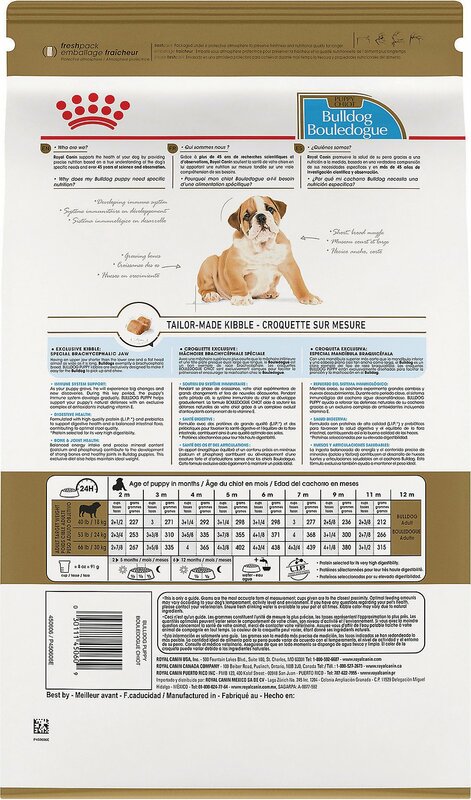 Royal Canin's Bulldog Puppy Dry Dog Food is designed exclusively for pure breed English Bulldog puppies from 8 weeks to 12 months. Digestive performance: Digestive health is essential during Bulldog puppies' growth period. Their digestive system is not yet fully developed and can't absorb nutrients in the same way adult dogs can. This formula includes L.I.P. proteins to help maintain a balanced intestinal flora. 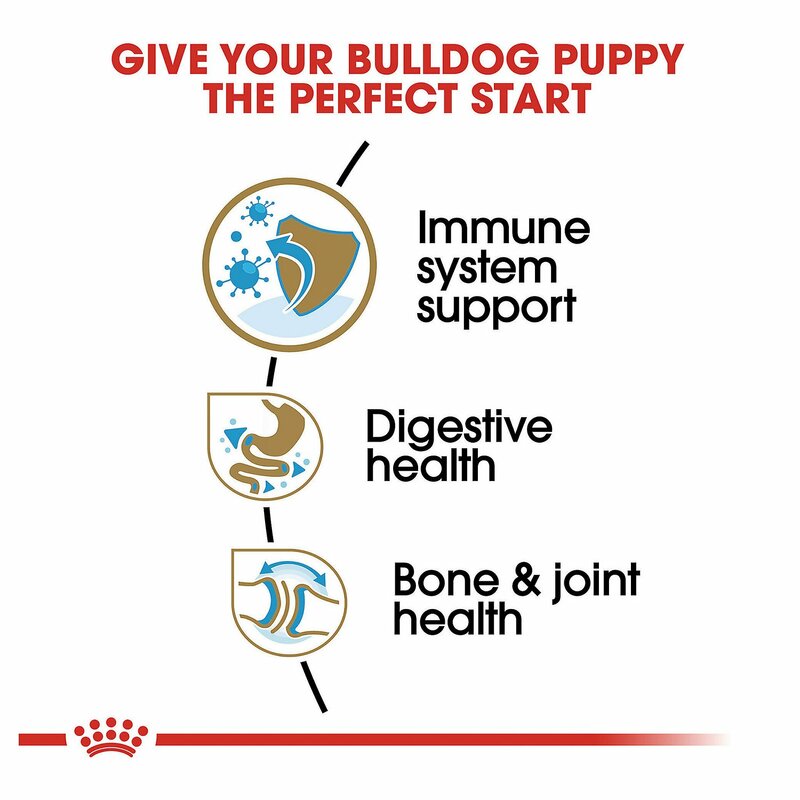 Bone & joint health: Bulldog Puppy Dry Dog Food supports Bulldog puppies' healthy bones and joints with appropriate calcium and phosphorus content. This exclusive formula also helps maintain an ideal weight. Natural defenses: During the growth period, Bulldog puppies' natural defenses are not yet fully developed. This formula includes an exclusive complex of antioxidants including vitamins E and C, lutein and taurine to maintain their natural defenses. English Bulldogs have a very short, broad muzzle that turns upward and thick, deep "chops" that completely overhang the lower jaw. The wave-shaped kibble design for this formula makes it easier for Bulldog puppies to pick up. I usually have no problems with chewy and I do plan on continuing to use the auto ship function I was pretty upset to find out the second bag of food I ordered for my pup had a hole in it and all the food seemed incredibly stale and I decided to throw it out and purchase a 30Lb bag from the store (hence my lapse in monthly shipping). Will definitely check the bags thoroughly next time. I'm new to the pet world so I was sceptical on which brand I should buy for Ace. 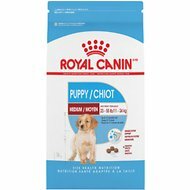 After countless hours of research & a lot of asking questions I decided on Royal Canin. I heard it was the top brand for Bulldogs. I'm glad I made that decision because Ace LOVES it. He was trying to bite the bag before I could even get it open. Takes him no time to eat & licks his bowl clean. I'd say we have a winner here. Great choice for the puppies who are your whole world!!! We are new to chewy! So far, Hoagie loves her new puppy food! For an English bulldog, it's an excellent choice and was vet recommended!! The food smelled and look delicious. When I made the purchase I didn't expect the food to be so helpful for my pet it had a great scent and they were properly sealed. RC Bulldog Puppy is Awesome! 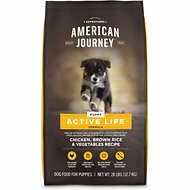 I have a male 7 month old blue American Bully mix puppy and this is the best food for him. He loves it and he has developed great muscles on it. Firm stools and no gas. Coat is shiny and soft. No issues. I will keep feeding Royal Canin for hid whole life. My bulldog was on Royal Canin presciption food from the vet. After that was gone, we tried to transition her to this. Day one she was SO gassy! We kept her on this food for 2 weeks. She was gassy every day and had the runs for 2 weeks before we took her off of this food. I switched from halo to royal canine by recommendation from my vet and my 4 month old bulldog loves it ! Will be giving him this until he is old enough for bulldog adult! Royal Canin should be your only choice of puppy or dog food. This company takes their task of creating a great food seriously. This is my 3rd American Bulldog. The shape of the food is made specifically for the breeds Brachia cephalic muzzle. The food also does not swell in liquid. And anyone who owns a Bully, knows that their gas can peel the paint off a brand new car! This food is sympathetically formulated for owners like us! Truly a great food. Expensive yes, but you will have peace of mind. Our puppy likes the food. But it certainly has not helped with the smell. He stinks worse now than before, and I didn’t think that could be possible! I won’t be ordering this product again!